Fourth full-page Illustration for Dickens's A Christmas Carol in Prose: being a ghost story of Christmas, Ticknor and Fields (Boston), 1869. 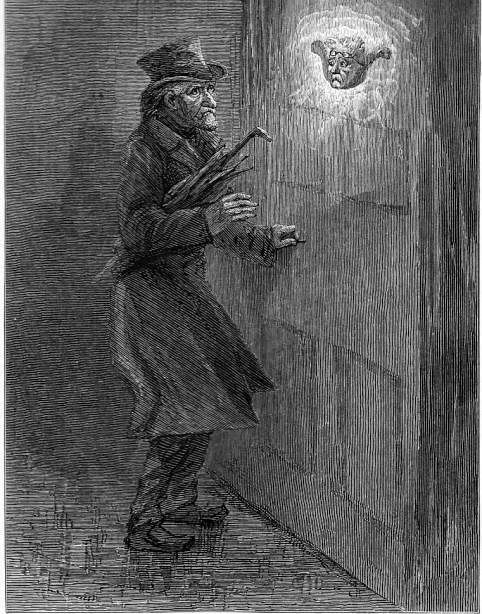 For seven years, ever since Ebenezer Scrooge, the surviving business partner, acquired Jacob Marley's house, the solitary bachelor has taken the front-door knocker for granted as he returns from his warehouse at the end of each working day. As usual, he has taken out his door key and proceeded to place it in the lock when suddenly he encounters Marley's face superimposed upon the knocker. Marley's face. It was not in impenetrable shadow as the other objects in the yard were, but had a dismal light about it, like a bad lobster in a dark cellar. It was not angry or ferocious, but looked at Scrooge as Marley used to look: with ghostly spectacles turned up on its ghostly forehead. The hair was curiously stirred, as if by breath or hot-air; and though the eyes were wide open, they were perfectly motionless. That, and its livid colour, made it horrible; but its horror seemed to be, in spite of the face and beyond its control, rather than part of its own expression. Unfortunately Eytinge's realisation has a slightly cartoonish look because he has made Marley's face congruent with the scale of the knocker, and the umbrella which Scrooge carries in the midst of a cold-snap strikes a false note. Although Scrooge has his key (mentioned specifically in the text) in his left hand as he reaches for the door-handle with his right, neither key hole nor door nob is evident, and the town house's door is but imperfectly sketched in, with no hint of an area yard in front of the house.